Today is the blog hop reveal for the Inspired by Reading Book Club! If you're not familiar with the group, you read a book from our book list and then create something afterwards inspired by what you read. It can be anything! For July, we read "The Immortal Life of Henrietta Lacks" by Rebecca Skloot. 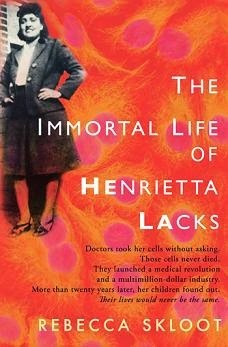 This is another non-fiction selection for our group and features an author probing the mystery of who Henrietta Lacks was and exploring the scientific and moral implications of the cells harvested from Mrs. Lacks. It's a fascinating read and gives life to a character who was the foundation of much of the medical breakthroughs of the last half-century. We had a fun meet-up at the shop! It's always an enjoyable time! We had originally planned to go with a Southern theme of friend chicken and biscuits, but time got away from us. Luckily, Laurel made blueberry muffins with a lemon glaze that held us over as we sipped moscato and chatted about the book and life. The meet-ups are so nice, because we just unwind and talk about what's on our minds. We do talk about the book, but the time is mostly spent bonding with others. This necklace was made by Dawn. It incorporates wooden beads with knotted hemp. She said she was inspired by the descriptions of Home House and early tobacco farm house that Henrietta grew up in. Dawn also brought these components. One is a a leaf that she found that she said resembled cells under a microscope. She wanted to decoupage it to a stone and incorporate it into a future piece. (Unfortunately the cats at her home got ahold of it and chewed it up a little.) The pebbles were adhered together and are supposed to represents cell dividing. This necklace was made by Laurel. She hung an electroplated druzy shard from a strand of strung seed beads with two corrugated gunmetal rounds, two fine pewter hand charms from my family at Green Girl Studios, and two base metal textured ovals. She said she was inspired by the descriptions of Deborah's red nails in the book and all the mentions of hands. This piece was also by Laurel. She strung polymer clay cells that she made from Ancient Pebble-colored Wooly Wire to form this necklace. Laurel explained the story to her daughter, Haileigh and showed her some pictures of cells. Here's the piece that her daughter made. It represents a cell and is on a paper plate with a concrete and paint. This is the piece that Alison made. Here's what she had to say about it: "I used the frayed recycled sari silk ribbon to represent tobacco leaves, both fresh and dried. I wanted it to have the look reminiscent of an award or medal. I made a pendant and incorporated antique lace behind her picture and the picture of her daughter, Elsie. 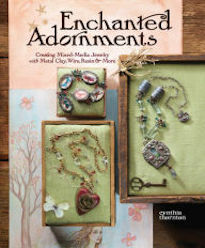 I coated everything in dimensional ModgePodge to seal and protect the images and lace. The found object key represents the key to scientific research and reminds me of Home House. I also used the wood beads and acorns to symbolize the House Home. The two lampwork glass beads that I used in the necklace look like her cells under a microscope." Here is the bracelet that I made. I was inspired by the idea of a DNA helix. I was particularly moved by the idea that cancer begins on the smallest and most tiny of levels. Something happens in the stranded sequence that makes the cells reproduce wildly. To represent that, I used a spiral stitch and used beads that reminded me of color of tobacco leaves. The silly thing is that after I finished this bracelet, I found a nearly identical one that I made a few years ago as a class sample. I quietly kicked myself for not being more clever and repurposing an old bracelet. 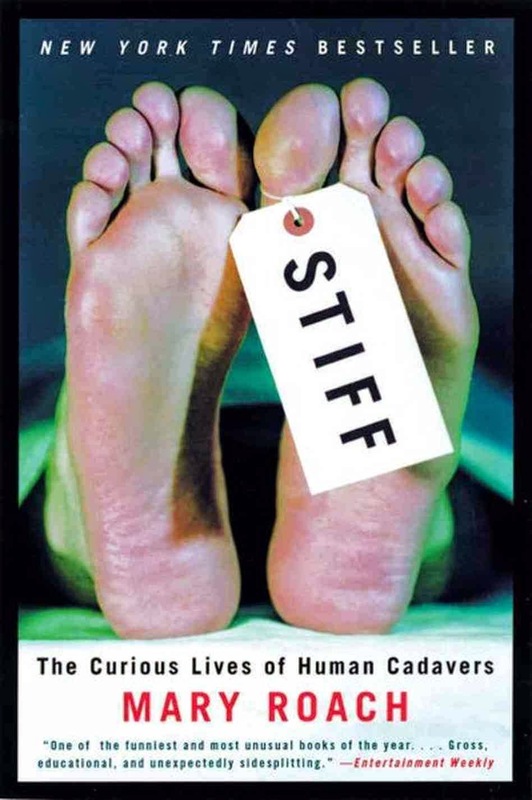 The next book is "Stiff" by Mary Roach. CLICK HERE for the list of books for this year's selections. If you are interested in participating and keeping up with us, CLICK HERE to visit our Facebook group. CLICK HERE to check out our Pinterest page for supplemental inspiration. The meet-up for August is scheduled for Wednesday, August 27th and the Reveal is schedule for Thursday, August 28th. Cynthia and I have been staying up late every night working on a brand new collaboration! We have such a good time coming up with ideas and making stuff! 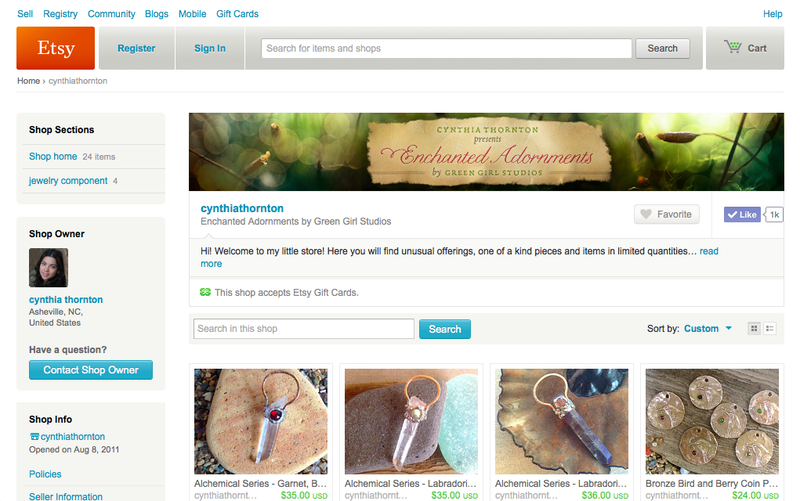 This time we came up with the Alchemical Series! We've selected some lovely quartz points with iridescent coatings and married them with hammered bronze. I love the organic quality and how magical they feel! As an added bonus, some of the money made off of the sales of the crystal point pendants will go towards printing expenses for Cynthia's new limited edition artist books. Nestled in the foothills, a ribbon of asphalt and concrete, embellished in yellow and white lines, spills out before us. It connects our destinations and origins, laying down a course. It's been awhile since I've driven any long stretches. I used to drive all the time for trade shows and I didn't think anything of going from Florida to New York or driving across the country. Now that I've been conditioned for the relatively short distance from home to work, it was much harder to get into rhythm of it. Once I started getting more comfortable again, it became easier. I snapped this picture at a convenience store in Virginia. 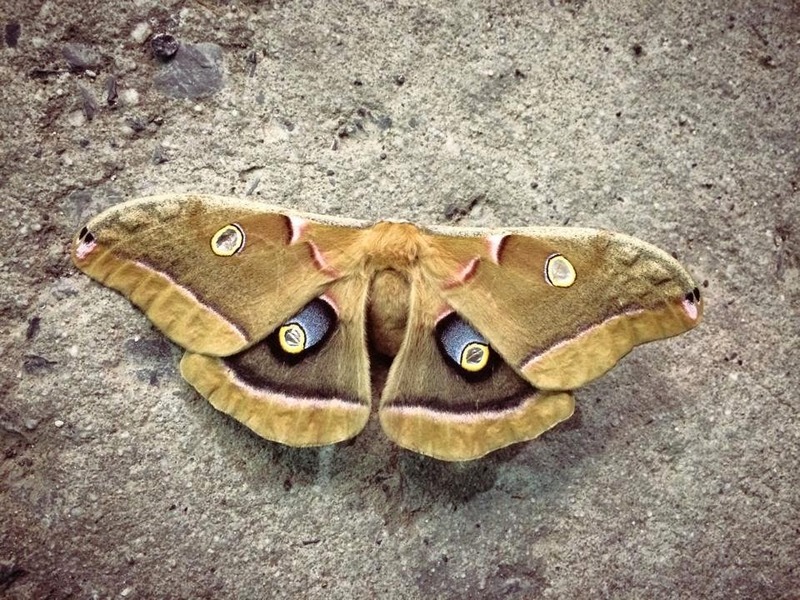 I was parked outside of their bright plastic sign, aglow with neon phosphorescence, and moths were swarming all over it. I love the markings, fuzzy body, and the pale pinks and blues. It made me think of my own trip. There are things that guide us, that draw us in. In my case, it was the lure of family and friends and the beauties of the Gem Show. Fortunately, even though there were walls of rain and heavy winds, I managed to make it here safely. I'm looking forward to spending some time with my family and being back in Asheville. It'll be good to see everyone! I wanted to thank everyone who purchased a pre-sale kit for the Royal Feather Challenge. THANK YOU! The kits are now sold out and will ship out after the first week in August. I am really excited about this challenge and can't wait to see what everyone makes! A few days ago I announced the Festival Lights Challenge and made the kits available for purchase. I didn't really think that I'd be announcing another challenge so soon! But... as I looked at the calendar, I realized that I had a big trade show in between now and the Reveal of the Dark Bloom Challenge. (I generally announce the next kit after the most recent reveal.) So I got the idea to push up the sale date, so that I could have more funds to work with at the trade show. This will give me a little more flexibility while finding treasures for the shop and for the future kits. Since I had the concept of the next kit figured out already, I decided to do a pre-sale of the kit. 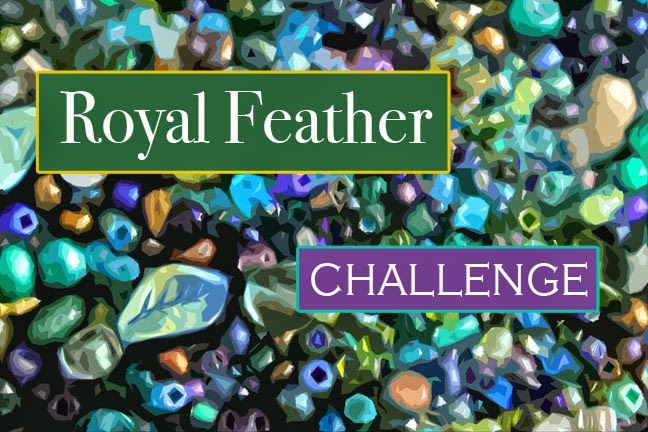 The next creative exercise: the Royal Feather Challenge. It's a blend of verdant greens, lush purples, and tranquil blues and teals, with glittering golds and burnt bronzes. I love this color combination. It looks so regal and stately. I have fond memories of peacocks. I remember visiting my grandparents who lived near a man with several as pets. We would feed them and he'd give us feathers. I also remember a particularly bold peacock at the botanical gardens in Hawaii. It was a fantastic trip and I loved seeing the peacock so close. If you're interested in getting a kit and participating in the next challenge, CLICK HERE. Hurry though! Kits usually sell out FAST! Please take note that this is a pre-sale and the kits will be mailed out in the beginning of August. 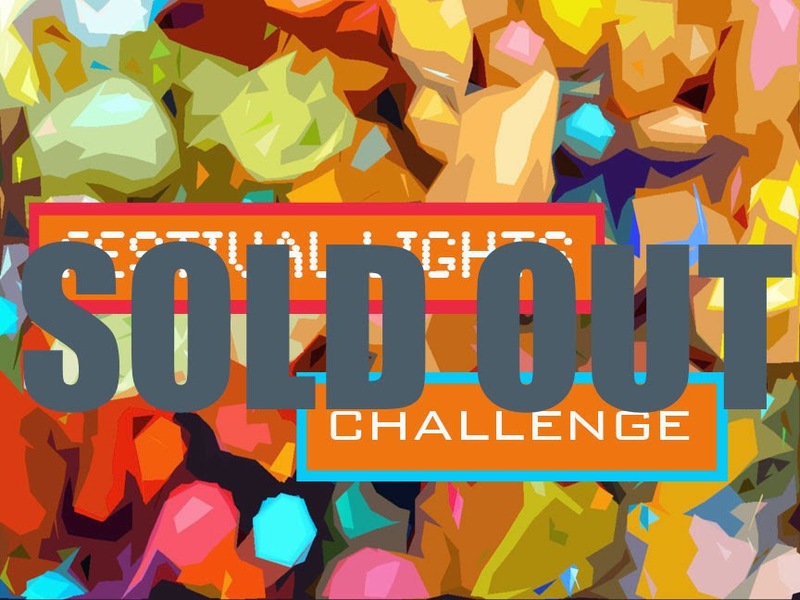 The Festival Lights Challenge Kits are sold out! They went quickly and were snapped up in record time. A big thank you goes out to all the challengers who purchased kits and signed up to participate! Your packages will ship soon. Mark your calendars! Your reveal date is September 18th! I can't wait to see what everyone makes! The reveal for the Dark Bloom Challenge is scheduled for August 7th! So stop by and see what everyone makes! This is the newest Reader's Challenge for my blog! Let me introduce you to the Festival Lights Challenge. If you're not familiar with the challenges, it's a fun and informal way to play, create, and challenge yourself with a pre-selected set of components. Let's see what you can make! To participate, you must purchase a Design Kit. This kit features a selection of premium Czech glass (both vintage and new), Indian glass, Swarovski crystals, carved acrylic, and Irish waxed linen. The kit also includes a Luxury Bead Blend. The Luxury Bead Blend consists of Japanese Miyuki seed beads, Toho seed beads, Czech glass, charlottes, African glass, rose quartz, quartz, Chinese crystal, Swarovski crystals, antique Venetian seed beads, vintage sequins, German glass, vintage Japanese glass, glass pearls, freshwater pearls, Matsuno seed beads, bugles, and trade beads. But wait... there's more! The pictures show a gorgeous mix of materials, but what isn't shown is the Mystery Component! Each kit will come with a special, handmade component that will remain a mystery until it arrives at your door! 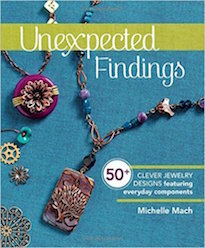 The Mystery Component might actually be more than just one bead or pendant. It's always a surprise. The Mystery Component will be publicly revealed on Monday, August 18th! We have been having so much fun with the kits and people have been asking for more, so we're going to do a trial run and start offering them on a monthly basis. You'll still have about two months to work on your project, but we'll be opening up the opportunity to work with them. In selecting the components for this challenge, I imagined a blur of fiery oranges, rosy reds, citrusy yellows, candy pinks, and cobalt blues. The inspiration for this blend was from a swirl of colorful lights, as seen from a carnival ride. If you're seen the challenges before, then you know that there are a lot of different design choices that can create unique pieces, and a single kit can produce several pieces if one desires. With your kit, using as much or as little of it as you like, create a piece that showcases your creativity, individuality, and artistic expression. 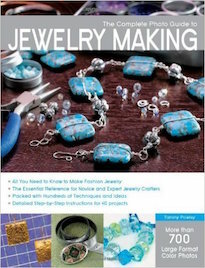 Ideally, your creation will spotlight the great selection of beads included, but the sky is the limit with what you can use and make! The reveal date is set for Thursday, September 18th, 2014! Post a picture on your blog or send one to me to post on your behalf (if you don't have a blog of your own). The Festival Lights Challenge will end in a blog hop, sharing all the lovely creations with your fellow participants! I also wanted to mention that all the Design Kits will be shipped with Priority Flat Rate mail. This can take anywhere from one business day to fourteen. For international participants, it may take longer! If you know that it takes a long time to reach your destination (from Southwestern Pennsylvania) please place your orders early! I will do my best to get your kits out as early as possible, but unfortunately can't be held responsible if it arrives late due to the postal service. All sales of the Design Kits are final and there are no returns or exchanges. With that all being said... I hope you have lots of fun and I can't wait to see what you make! 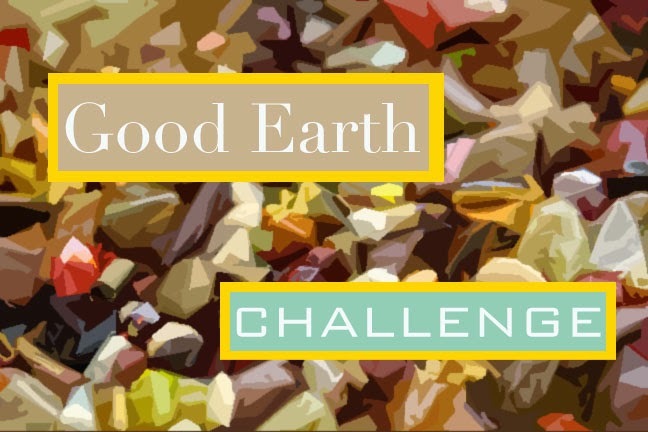 Today is the Reveal for the Good Earth Challenge! If you're not familiar with the challenges, I put together a Design Kit and offer them on a first-come, first-serve basis. Challengers claim their kits and I then send them off around the world! Each participant has about two months to create a piece and at the end of the challenge, everyone shares what they created! For the few kits this year, I've been inspired by the Pantone Fashion Report for Spring 2014 and this time, I focused on Freesia, Hemlock, and Sand, with pops of Cayenne and Celosia Orange. In selecting the materials, I thought of the bountiful, good earth. I saw in my mind fields of tall grasses, waving in the wind. 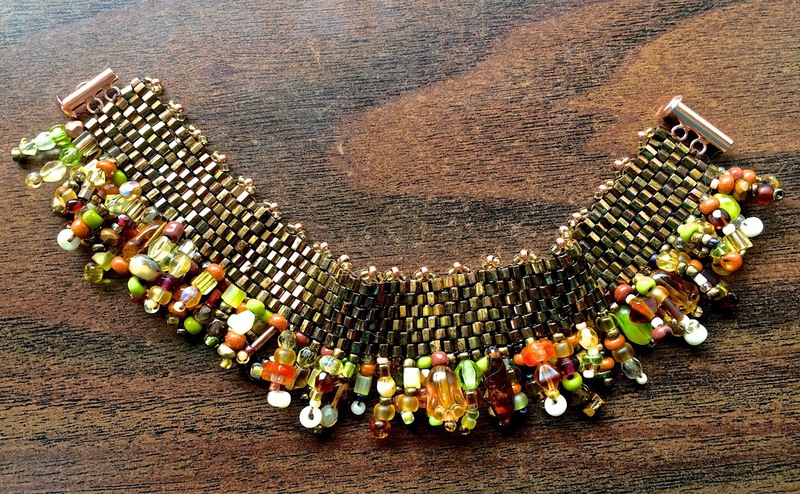 The kit was composed of a Luxury Bead Blend, lots of Czech glass (both old and new), African glass, brass, Japanese hex-cut seed beads, Hamilton gold, waxed linen, and more. Participants could use as much or as little of the kit as they liked. 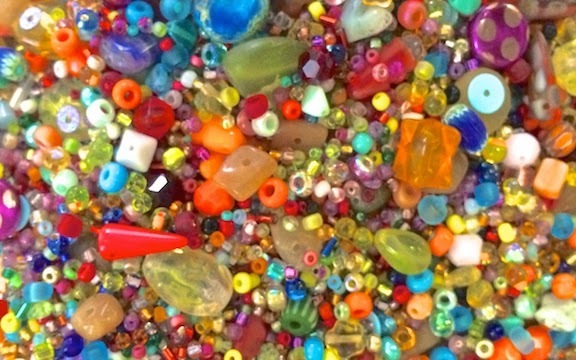 Here's a close-up of the Luxury Bead Blend. It's a random assortment of golds, browns, greens, and pops of orange, cream and red. This blend included all kinds of yummy treats, like Czech glass, semi-precious stones, Swarovski crystals, different kinds of Japanese seed beads, and so much more! 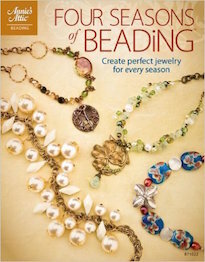 Usually there's enough beads leftover to make several projects and some challengers do! That's not all the kit includes though! There's a Mystery Component. In this case, there were two Mystery Components. No one knows what they are until they arrive at the challengers' doorsteps and even then, they can't share what they are until the Reveal date. This is a strand of Faux Moroccan Amber. I was inspired by the luminous beads and decided to make some out of polymer clay. 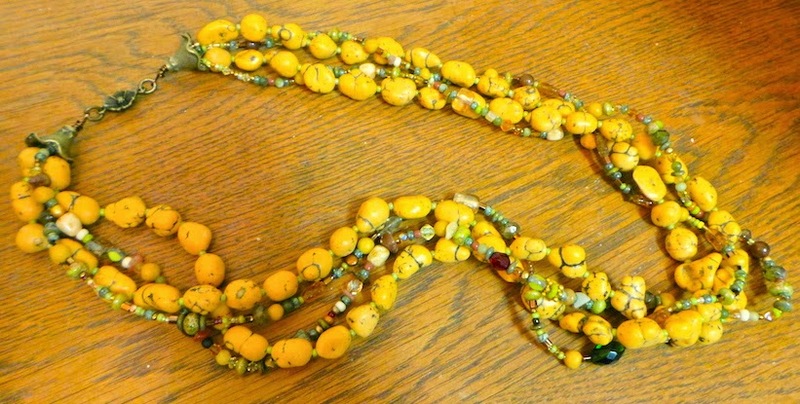 I then stained and colored the Faux Moroccan Amber beads and hand-polished each of them. The second component was a polymer clay leaf charm. I craved the mold, pressed them out, baked them and then colored them with a variety of inks, colored waxes and paints. This necklace was made by Laurel. Here's what she had to say: "I liked the mishmashed look of the Good Earth blend so much that I decided to do the same thing with the larger beads! I made a simple loop of these strands and added some heavy duty chain to complete the look. The length can be adjusted but I'm keeping it longer to pair with a black top, leather jacket and boots to wear this fall!" This necklace was also made by Laurel. Here's what she had to say: "I played with this piece for almost the entire duration of the challenge. I knew I wanted to use this imitation turquoise as soon as it was posted on Facebook by Allegory Gallery. I thought that a mix of bead blend braided around these chunky stones would be very unusual. Then it was a matter of how to tie it all together. I visualized the antique brass flower at first, but then I tried a bigger bead from my stash. When it didn't look right to me, I went back to my original plan and am glad that I trusted my instincts, as I'm quite pleased with the result." 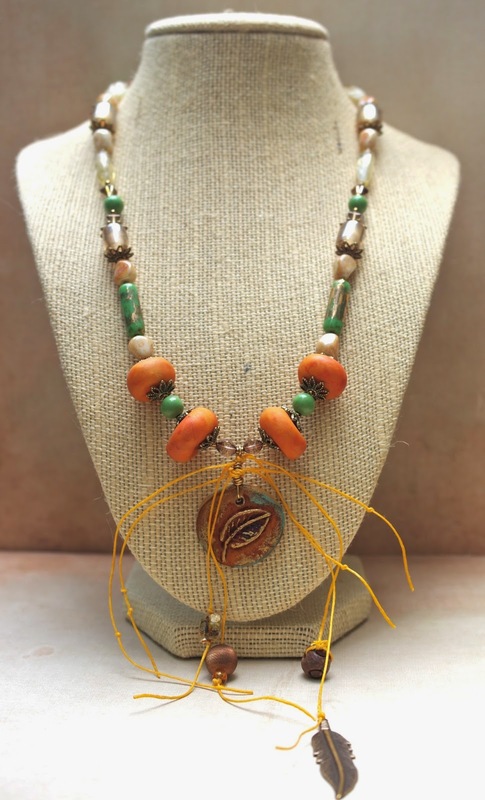 This mixed media necklace was created by Kim Griggs. I love how she incorporated found objects with the mix to create a really eclectic piece. 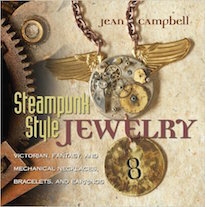 It looks as though each element tells a story and there's a powerful narrative flare to this texturally juicy necklace. This necklace was made by Deb Floros. 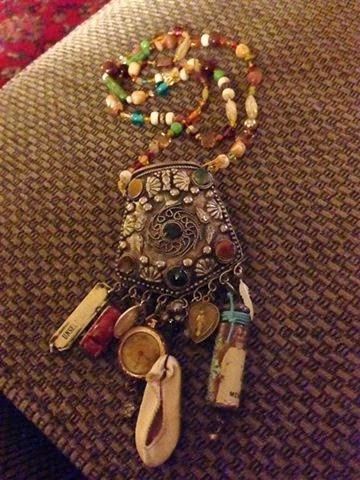 Here's what she had to say about it: "This "Good Earth Talisman Necklace" is almost completely made with elements from the kit. I really enjoyed the polymer clay focal and beads! I added the waxed linen and some pieces that made the necklace almost appear like a talisman. I love the funky, earth feel of this piece." Here's an alternative view of the Good Earth Talisman Necklace made by Deb Floros. This bracelet was made by Deb Floros. 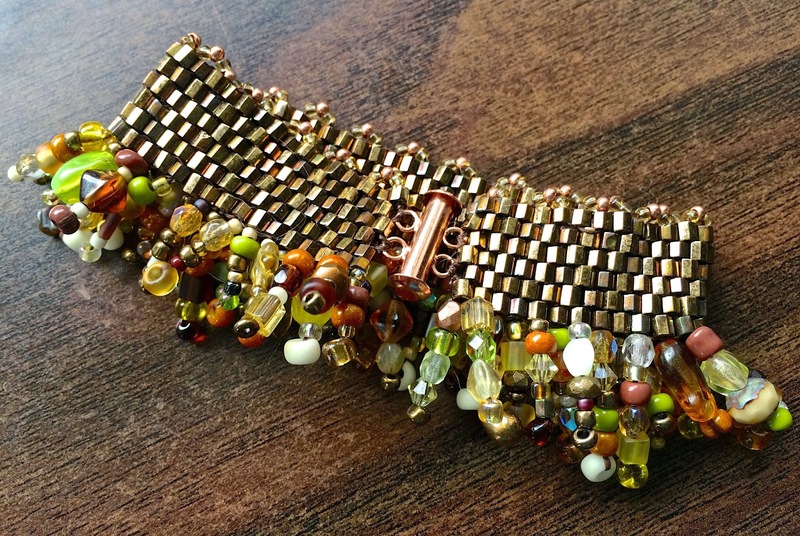 Here's what she had to say about it: "The bracelet is all about Earthy Glam! 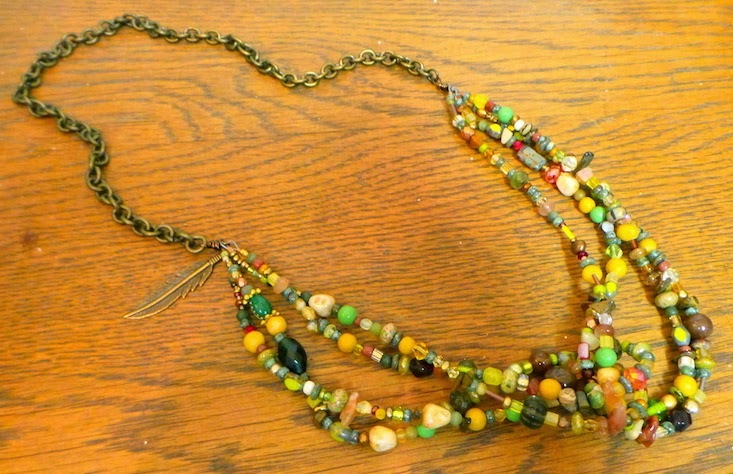 I love the shine of the beads and the wonderful earthy tones. This bracelet is made almost entirely with beads from the kit. I strung them on gold memory wire and plan to wear this one often!" These earrings were made by Deb Floros. 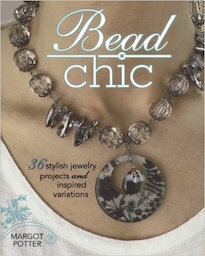 Here's what she had to say about them: "I really loved these clear-ish glass Chicklet beads! 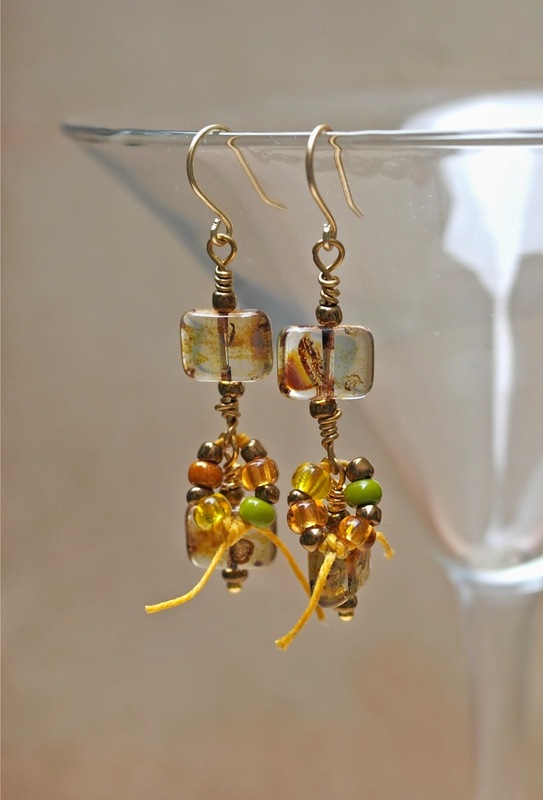 I combined them with gold elements and used some of the waxed linen to attach more of the pretty glass beads. I think these earrings will go wonderfully with the necklace." Here's another view of the earrings. This bracelet was made by Ann Mergl. 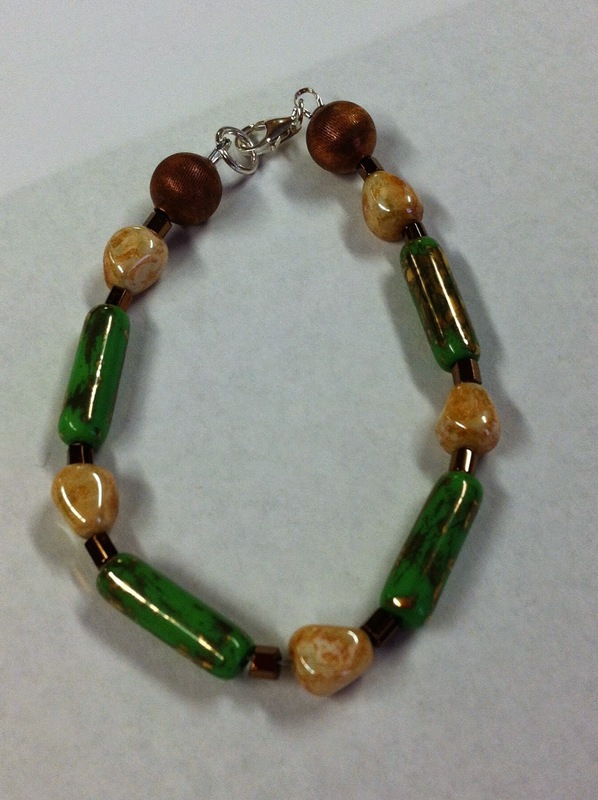 This bracelet is made of the Czech glass included in the kit and has a beautiful elegance with the repetitive pattern and earthy colors. This necklace was made by Ann Mergl. It's a multi-strand necklace with one longer length and a shorter one. The beads were mostly from the kit with the addition of some blue beads, which pops the white and plays with some traditional Native American color palettes. This necklace was made by Alison. It incorporates the Faux Moroccan Amber beads and is paired with some vivid, contrasting blue beads that make the design really pop. 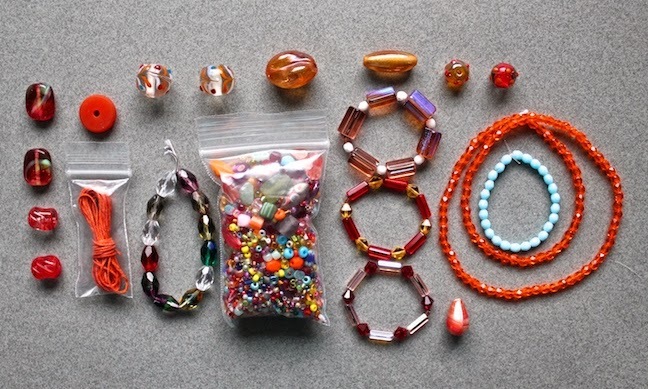 The cross pattern of the blue beads and how the "amber" beads are laid out, makes the piece looks like "XOXO" pattern. This piece was made by Alison. It can be worn as a necklace or as a wrap bracelet. It features mostly pieces from the kit, knotted on the waxed linen. It has wonderful texture and a beautifully beaded feeling to it. This bracelet was made by me. The base of the bracelet is composed of the Japanese hex-cut seed beads, woven together with peyote stitch. The bottom edge of the bracelet has a beaded fringe with beads from the Luxury Bead Blend. Here's another view of the bracelet. It's held together with a copper tube clasp and has a delicate picot-inspired edge. When I thought about this bracelet, I almost thought of it as a ruffled cuff that could be worn with other bracelets and be a part of a stacked ensemble. But wait... that's not all! Please swing by the blogs of the other participants from around the world! Check out what they made for the Good Earth Challenge! 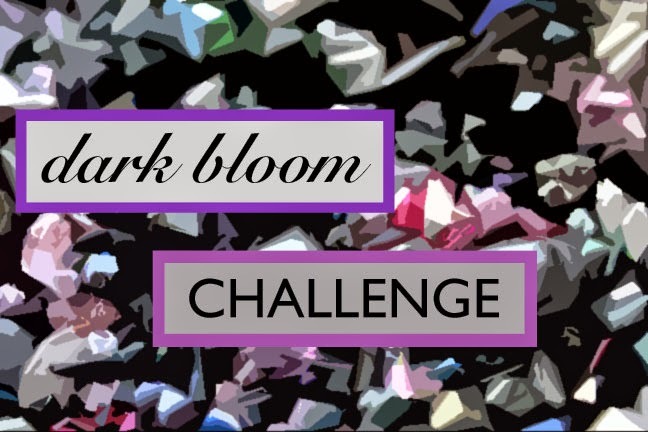 The Dark Bloom Challenge is up next! The Reveal is scheduled for Thursday, August 7th. Check back here to see all the lovely creations. Also, tomorrow (Friday, July 18th) the Festival Lights Challenge kits will go on sale! Swing by tomorrow and get ahold of your kit! If you're interested in participating, the kits sell out super fast, so make sure to grab one while you still can! 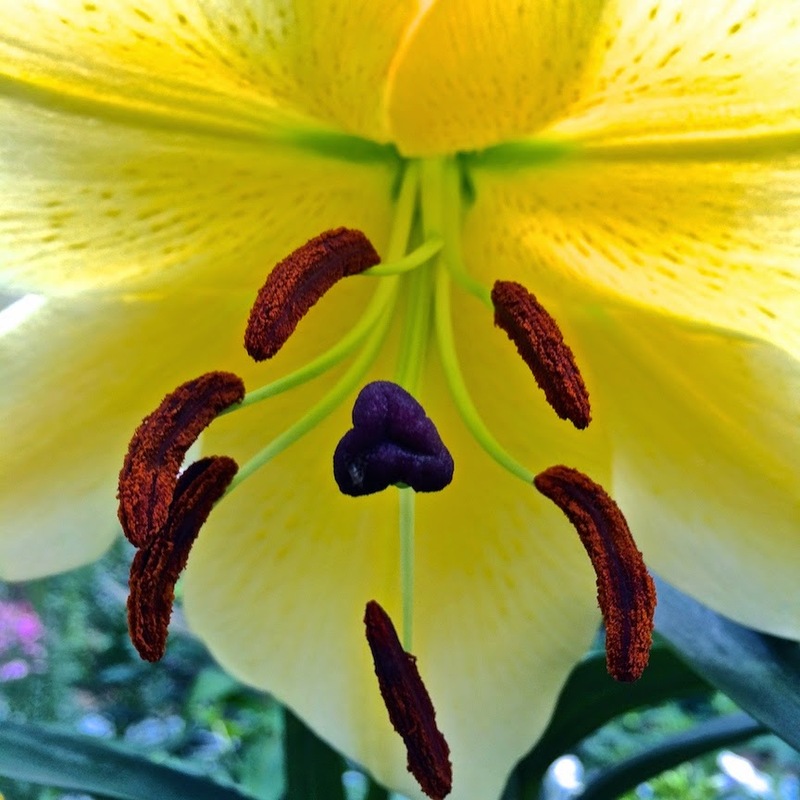 Dreamy intoxication, an airborne floral drunkenness, wafts through the summer haze. The source, a cluster of earth-bound stars, rooted in the dirt and exploding with color and heavy, sweet perfume. 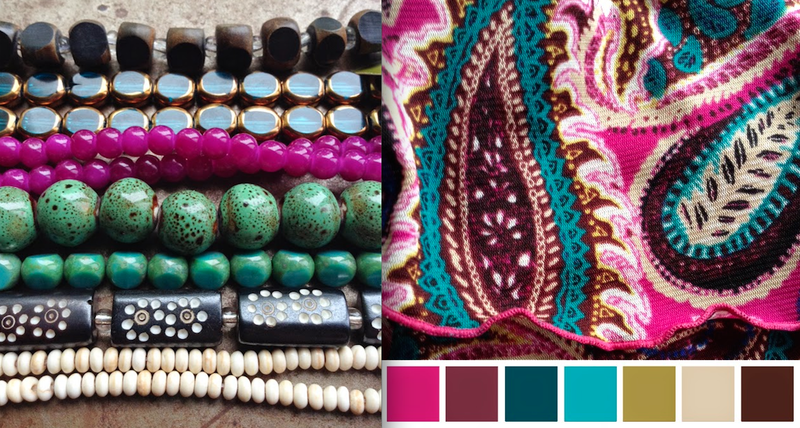 Heather Powers of HumbleBeads and Lorelei Eurto teamed up to offer a fun creative challenge! They found an inspiration piece, created a color palette, and selected beads from Michael's to be used in the challengers' creations. This is Alison's piece! 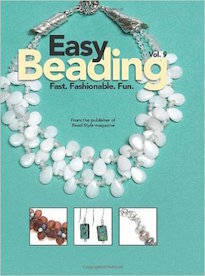 Here's what she had to say about it: "I used at least one of every bead and added my own clay beads. I was inspired by Donna Kato to create these swirly components. I strung one half on leather and the other on two different colors of waxed linen to create this necklace." Alison also made this piece! Here's what she had to say about it: "I created this matching bracelet as an ode to one of our hosts, Lorelei. I used her template from the magazine to make this waxed linen, knotted, multi-stranded bracelet. I am hooked on making them! Thanks Lorelei for the tutorial!" This is Laurel's piece! Here's what she had to say about it: "I used all the beads! Hooray!!! My added components were the polymer dangles from our "clay date" and the brass spacers I purchased from Allegory Gallery. I made my own chain from brass jump rings and split rings and used some waxed linen from the Deep Waters Challenge that I had leftover, to fill some space and add some symmetry to the piece. Overall, it's a fun Boho chic piece that I will definitely have a good time wearing! What a fun challenge!" This is my piece! I had a fun time with the color palette. They aren't colors that I use much, especially in combination. So it was a good challenge to work outside of my comfort zone to create this bracelet. Everything in the bracelet is from the bead selections that Heather and Lorelei picked out, except for the balled headpins, toggle, and chain. 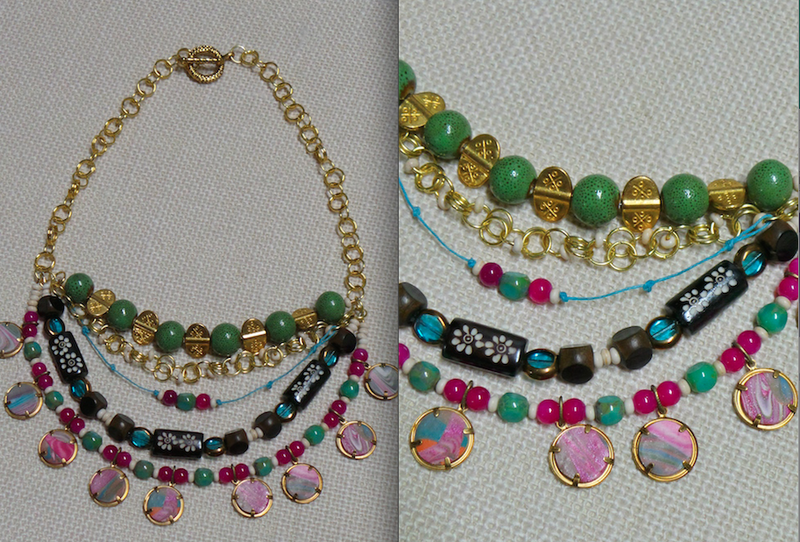 I used these items to create the wire-wrapped dangle embellished chain. Here's an alternate view of my bracelet. When I made it, I thought about the fabric inspiration and the fun movement it must have in a dress. So, I wanted to incorporate as much movement as possible. I fell back on one of my beloved techniques to create this dangly bracelet. Make sure to visit our hosts' blogs! Heather and Lorelei did a fantastic job organizing this blog hop. And when you get to Heather's blog, take a bit of time to hop around and see what all the other participants made. (And if you made something, make sure to add your link!) CLICK HERE to visit Heather's blog to see the full list of participants! For the past few months, I have been experimenting with alcohol inks on all kinds of different materials. 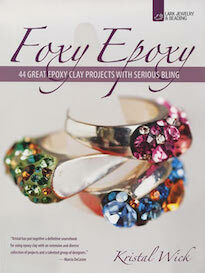 I've played with everything from polymer clay, to ceramic. I've even had success with bone and resin. Enameling is great, but I have wanted to try my hand at further exploring the addition of color to metal without the aid of a torch or kiln. I made THESE White Copper Dragon Pendants awhile ago and thought that they'd make excellent prototypes. 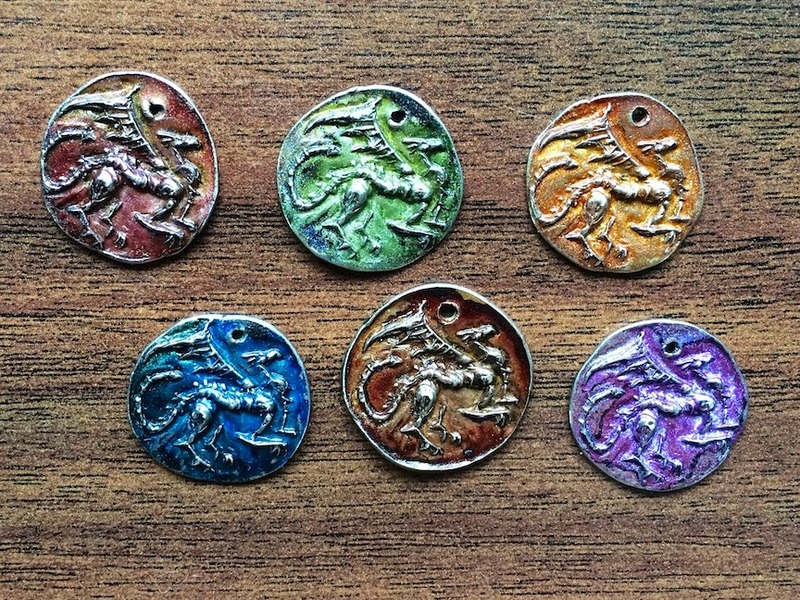 After the alcohol inks were painted on, I buffed the coin pendants with a brass brush and brought out the highlights in the raised areas. I then sealed everything up under a few coats of a fixative aerosol. I didn't know what to expect with this little experiment, but I'm quite pleased with all the results! I got an email from Elvee/Rosenberg Inc. this morning. If you're not familiar with them, the company has been around for 100 years and is a premium importer of European beads and findings. The email enclosed a set of reports including color charts and descriptions for the upcoming Eurobijoux Fashion Trends. While some artists I know say that they ignore trend reports, I find them fascinating. It's almost like looking into a crystal ball. If you're not in the cutting edge of the fashion industry, it might not seem like it'll have a direct impact in your work, but you'd be surprised with how much these reports do play a role in our everyday lives. Everything from the color of appliances in your kitchen to the cars on the road, to the things people wear on TV and in the magazines... it permeates our culture.